Setlist Break – You can use this for any sort of break you want. But the intention was for a band to take a break. It contains the total set time on the first line. The second line has the duration of the break. You can also put notes in the break. 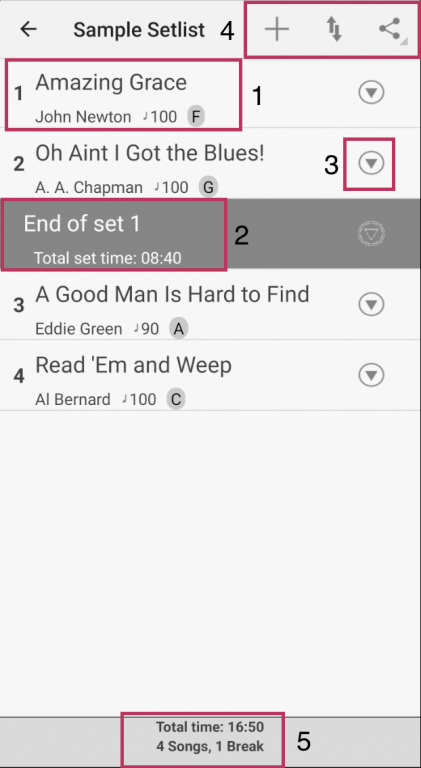 To show the notes in the setlist songs you need to turn it on in the Preferences. 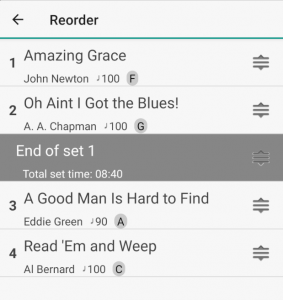 Editing toolbar – These icons allow you to Add New Songs, rearrange the setlist, or Share Setlist. More information is below. 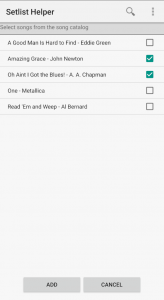 From catalog – Choose existing songs from your Song Catalog. Tap the icon with a plus icon shown in #4 and choose “From Catalog”. The view above is the Song Catalog selector. 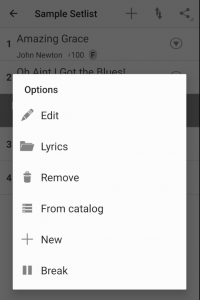 Check the songs you want to add and they will be added in the order you check them. If you want to add the song twice tap the 3 dot button the upper right and choose “Show All”. Tap up/down arrow in #4 and it will show you the view below. Tap and hold the icon with 3 vertical lines on the right and move your finger to the spot you want to place the song. To delete a song from the setlist you need to be on the main screen. Tap the back arrow if you are reordering. Tap the circle button with a down arrow and choose “Remove”. 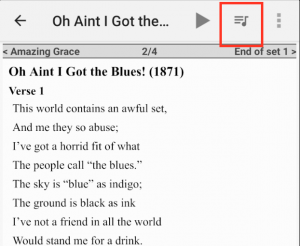 To add songs after a certain song, choose one of the menu options above and new songs will be added after the song you choose. Lyric Search – Search for a song from the internet to add. This may not be the best option if you are at a gig with limited internet access. If you want to remove the Insert Song button open the main menu of the app. Tap Preferences. Uncheck the “Show Insert Song Button” option.